Prambanan plain, the largest Hindu temple complex in Central Java, 17 km away from Jogjakarta. Often overshadowed by Borobudur temple, just 40 km away from this temple. But don’t get me wrong this temple is certainly worth of visiting. This is actually the evidence of the perfect Hindu art, the most beautiful and magnificent Hindu Temple of Java. This huge complex is dedicated to the Hindu god, Shiva. The complex was built between 8th and 10th centuries by Rakai Pikatan of Sanjaya Hindu Dynasty of Mataram. Artistically and architecturally is the Shiva temple the showpiece of the Loro Jonggrang complex is the most perfect one. The main spire is 47 meters high and the temple is abundant with carved. The interior chambers are wonderfully carved and decorated with tales from the Ramayana. In the main chamber at the top of the eastern stairway, the four armed statue of Shiva, the Destroyer, is the fact that this mightiest of Hindu Gods stands on a huge lotus pedestal, a symbol of Buddhism. The Ramayana Ballet is also held at the outdoor theatre of this temple. Performance mostly held on full moon nights each month and dry season, from May to October. This performance is really worth of visiting, make a time to enjoy it. There are two other temples shared this plain, Brahma temple to the south and Vishnu temple to the north. These temples are smaller than Shiva temple. The Brahma temple is carved with the final scenes of the Ramayana. It has a four headed statue of Brahma, the god of creation. The Vishnu temple reliefs tell the story of Lord Krishna. It has a four armed statue of Vishnu, the preserver. Nandi temple, this little temple facing the Shiva temple, has one of the finest sculptures of Prambanan. There are also group temples on the north side like Plaosan temple and Sewu temple. About three km away from the complex. 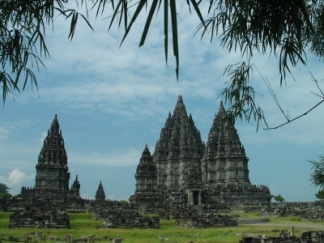 Candi Sewu is a large, second largest Buddhist temple complex after Borobudur. Candi Sewu means thousand temples. The complex consist 249 shrines surrounding the major temple. There are other temples on the western side like Kalasan temple, the oldest Buddhist temple on the this plain and Sari temple, famous for its decorated and carved panels. The best time to visit this artistic java temples is early in the morning or late in the day when it's less crowded.